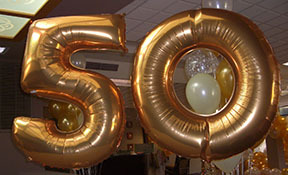 Cherri's Balloons the Preferred Choice | Balloon Decorating & Decorations – Creative balloon decoration for over 30 years. Contact us today to order your balloon decorations. 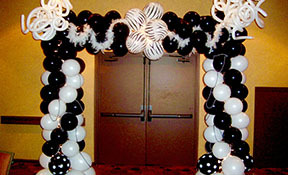 The choice of people and organizations who want the best Balloon Decorations and the best price! The Difference You Want: You Need It, We Gladly Provide It. 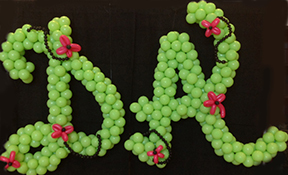 Balloon Art can transform an ordinary room, event or location into a magical atmosphere. Balloons have the ability to emanate the range of feelings from festive and lively to elegant and charming all by the colors chosen and the style of arrangement. 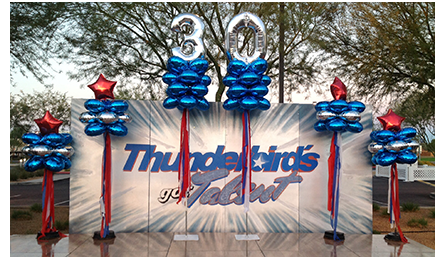 I have been creating balloon art for over 30 years in the Phoenix valley and love what I do. Balloons are my passion. Every job is an Art Project waiting to transform a room into what my clients have dreamed of. Balloons can be the icing on the cake to even the most elegant of rooms. They are flexible and transforming in their ability to create whatever atmosphere or theme you have chosen. 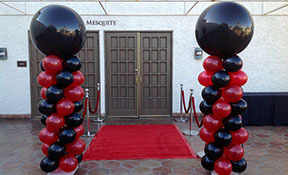 Balloons can create excitement, visual impact and attract attention like no other decor with great value for the money. I love what I do. I have been doing balloon decorating for over 30 years and I never tire of it. It is art to me and I love it. Balloons are so unique. It does not matter your age, your background or your event everybody is enchanted, and that is why balloon decor is so great. All decorating I do is personal, large or small. When I walk away from an event, I want everything to be perfect and I do my best to make it that way. I started this business back when my husband was in law school and after my first job, I thought, I LOVE this, and from there Cherri’s Balloons blossomed into what it is today! I raised 4 sons and 1 daughter under the shadow of my balloon business and they were my best workers. I currently live in Mesa and decorate for the greater Mesa/Phoenix Arizona area. All consultations are personal with me. I work with any theme, size, or budget. You name it, I have probably decorated for it, private or corporate events: parties, meetings, weddings, showers, proms, bar and bat mitzvahs, conventions, deliveries, and more! Balloon decor really has no limit when it comes to any holiday celebration or traditional event, whether for individuals, families, businesses, or schools. Whatever the theme, I have likely created unique decorations for it in the past. I would be happy to discuss with you any unusual ideas you may have that you want created out of balloons. Please feel free to check out my instagram account or my blog, which updates new balloon decor on a regular basis. Balloon Art can transform and ordinary room into a magical atmosphere. Parties need balloons to be a REAL party. You do not need a theme to make it fun but we most certainly can incorporate one. They are the icing on the cake! Balloons have the ability to emanate the range of feelings from Festive and Lively to Elegant and Charming all by the colors chosen and the style of arrangement. For weddings, the pearlized colors are often the choice to set the stage for an event to remember. 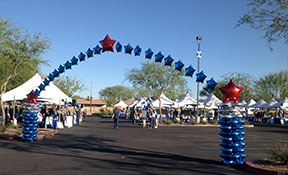 Corporate clients frequently have the unique need to create an atmosphere, build excitement, draw attention, or make a visual impact in a big way. For both indoor and outdoor events, we have made their events come to life. Arches come in all shapes and sizes. They can be used in many forms that range from pretty simple and airy to spectacular in size and detail. Depending on your need and use there are an amazing amount of choices and price ranges in this category. 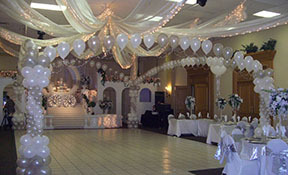 Along with arches, this category is one of the industries basic decor choices that add so much to a room, entrance, stage, dance floor, or outdoor area. They can be short or tall, detailed or simple, spiraled or themed. We design them in all different ways. They have a lot of versatility in their use. The sky is the limit in this area. 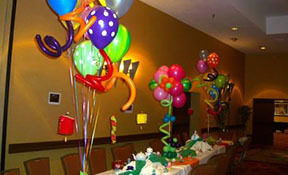 Depending on your theme, imagination and budget we have created very elaborate centers with each table being a different theme to the very basic centers of a tri-balloon bouquet. They all have their perfect effect. Liven up the dancing with a splash of balloon color. 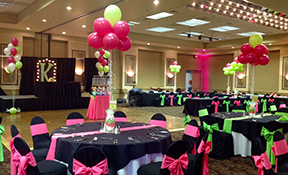 The entire room can be dressed in balloons or concentrate on specific areas of focus and make a statement that really “Wows” the guests when they walk in. The Entrance, Dance Floor, and Table Center Pieces are often a main choice of focus. These events are significantly important to the participants and balloon decor produces the Large Scale visual impact that is needed. Incorporating the school colors and knowing what works for the layout of a large event can make a big difference in it’s success. Indoors or Outdoors balloons are perfect when installed properly. Endless are the possibilities when it comes to the choice of themes. Between Proms, Corporate Clients and Bar/Bat Mitzvahs I have incorporated my client’s ideas and created personal designs that cover an incredible amount of concepts and styles. The ability to craft framework allows me to design very individual balloon sculptures, logos, centerpieces and much more. 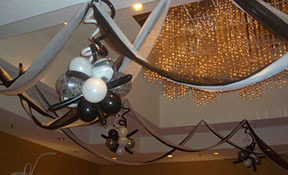 Balloon sculptures are often produced on a larger scale. Doing Initials, Names and Numbers are popular choices and can be designed to match invitations, announcements or logos. 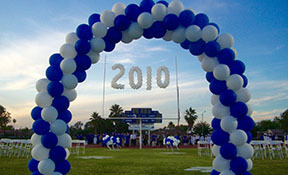 I design various shapes that enhance the theme of an event by using hundreds of different sized balloons to build the creation. It is an art and is very personally creative. 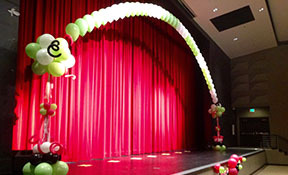 Balloons used as Stage Decor can set the tone for whatever comes once the curtains are opened. From private venues to major public displays balloon art can create a look to impress, charm, frame and transform a very plain area into an imaginative presentation. Deliveries should be very personal and presented with a flourish. 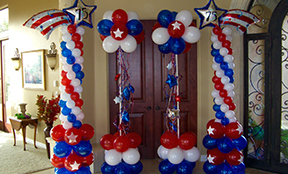 Receiving a large balloon bouquet is a memorable experience no matter the recipient’s age. They always make a big impact especially to the young at heart. We deliver a basic bouquet that is beyond basic with our unique accents. We deliver larger bouquets on request. When possible we text pictures of the delivery to our client. Fill out this contact form and I’ll get back to you as soon as I can.